Is it possible that finally some of the “names” in golf are realizing that the game of golf in its present form isn’t working? Yes for traditionalists, it is just fine but they should be concerned that others do not share their passion. I am quite sure that Mr. Nicklaus does not follow my blog. But, it’s a fact that the game needs to attract more players and we know that any of the newbie’s will get hooked and move on to the traditional game. But it doesn’t matter if they do. They just need to enjoy and participate. As I have said for years, the game needs to be easier and that means shorter, either in hole distance or number of holes or both. Doesn’t mean you have to build easy short courses but let’s at least acknowledge that there are people who prefer rounds with fewer holes and tee stations that allow the short hitter to enjoy the hole. Again, time to play, cost, and difficulty remain the biggest barriers to growth. Make the course a little easier or shorter (at least the option) and it will take less time to play, be less difficult, and should cost less to build and maintain. Doesn’t seem like rocket science to me. Jack, let’s get together for a chat next time you’re in town! Scott, from our Sales & Marketing department, is guest blogging about his recent Tour-on-Wheels event with the MPSTMA. 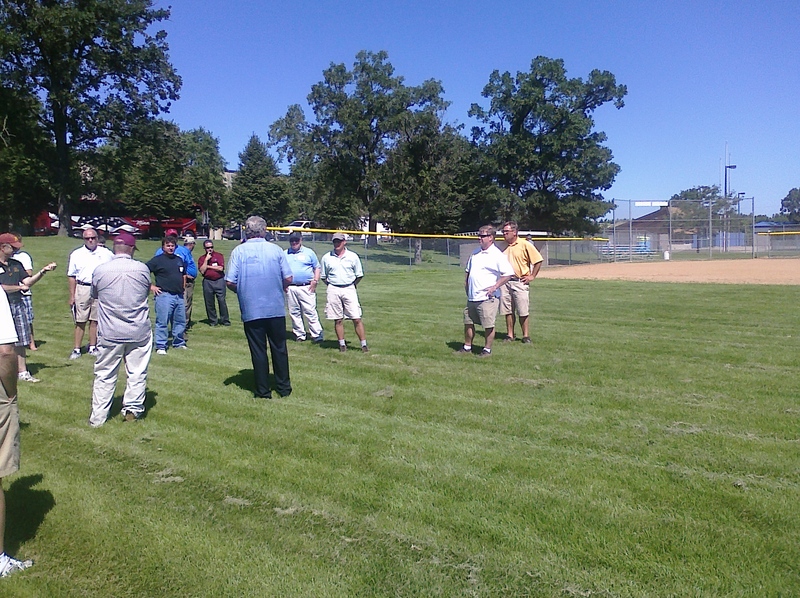 Two weeks ago I joined the Minnesota Parks & Sports Turf Managers Association (MPSTMA) on their annual Tour-on-Wheels. 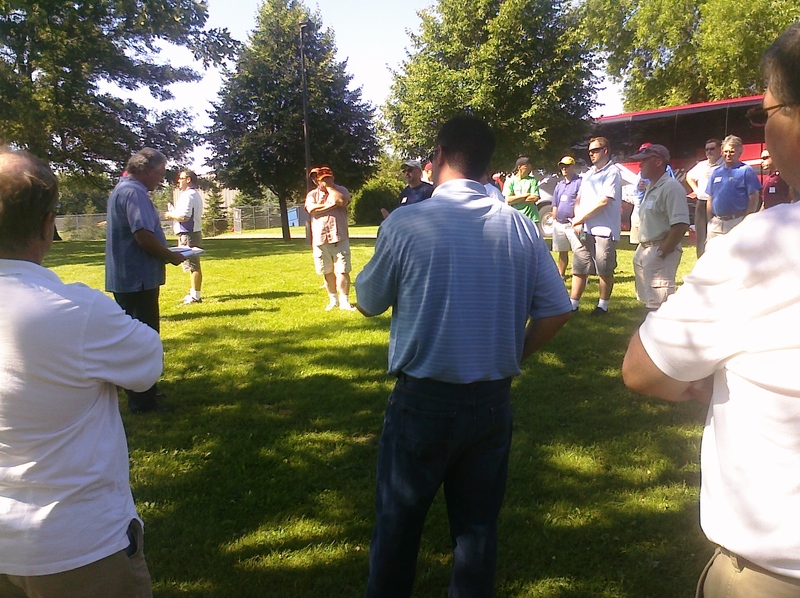 The group travels around central Minnesota and visits various Parks and Sports Turf Facilities to hear about what products or issues their peers are tackling. The most recent “Tour” included a stop at Blaine High School, part of the Anoka-Hennepin School District. There Tom Redmond, Director of Grounds for the district, told us of his challenges. First off let me tell you about the Anoka-Hennepin School District. It’s the largest in Minnesota, serving 40,000 students and 248,000 residents living in 13 communities in the suburbs north of Minneapolis and St. Paul. There are 5 high schools, 6 middle schools and 24 elementary schools. So as you can see and imagine there are a lot of grounds to manage and people to keep happy. Blaine High School opened in 1970-71 and of the 5 high schools in the district sits on the smallest footprint. When it opened it easily could handle all of the sports the school had. There was no boy’s soccer, lacrosse and by the way there weren’t any girl’s high school sports as well as all of the sports camps and practices that utilize them. The growth of all of these sports has created some interesting problems for Blaine High School, and I can imagine other high schools all over the country – Figuring out where to put all of these sports when no land is available and many of them are practicing and playing games all at the same time. Once you accomplish that goal there is another huge issue – How do you keep the playing surfaces (most times grass but an ever-growing sector of artificial surfaces) safe and playable with all the use. These are just some of the issues Blaine faces. Many times games and practices overlap upon each other. In order to keep things in their place fences had to be put up and others had to be removed. Also, how do you keep grass growing or grow grass when fields are constantly being used and the growing seasons are your busiest times? They have gone to dormant seeding and higher mowing heights to get better results. Tom Redmond explaining what caring for the Anoka-Hennepin School Districts fields entail. This was quite an eye opener for me. I knew that all of the green grass folks had numerous issues with which to deal but I sure never thought about the extent. Especially what the addition of new sports does to the already small spaces some have to deal with. This “Tour” gave me a whole new appreciation of that groomed field I see in the neighborhood! Can’t believe it. Haven’t really thought much about my age but having turned 60, I have taken pause more than once to just think about that. I used to check the obituaries most every morning but once all my close older friends passed along, I stopped. Now I am back looking at them. It seems strange that not so long ago I remember thinking that 40 was really old, and 60 meant one foot in the grave. Now that I am there, I can only smile. So now I am hoping to see 25 more golf seasons and actually be able to play. Seems keeping one’s health into mid 80’s should be attainable with reasonable attention to diet and condition. But as the old saying goes, “man plans, and God laughs”. With so many friends facing health issues, I consider each day a gift. I only hope to live like it truly is. To begin, my first thought as I look over a true hodgepodge of equipment; this stuff isn’t that bad. Maybe I should just use it….. Yes dear. I will throw it out and start over. In the basement, I have three sets of irons that my Dad played with for years before he died which was in 1982. They are forged clubs; Ultra, Haig Ultra, and another related set. All in great condition. In rafters and being saved until worth millions to some collector. Whatever. eBay. I have two trunk caddies. Remember those cardboard boxes that has a compartment for everything for the car trunk golfer? In there I found socks, assorted ball markers, scorecards (mostly forgettable), and of course, Allen wrenches which I always carry to service various equipment on the course. A few dozen balls, from when TopFlites and Pinnacles were THE balls. Some with logos! Do golf balls go bad? Two pull carts to bring back memories of my wife’s flirtation with golf. Three pair of golf shoes. Not moldy but clearly pretty stiff. Wonder if the style has come back yet? Maybe better toss out. Shoe trees were rusty. Numerous golf bags. One great big one that was a giant cart bag and sure looked impressive as I came up to the first tee. Didn’t use it much as it didn’t fit, image wise, my wild slice off that first tee. Also a couple carry bags, one of which still has legs that fold out properly and might still be usable. Nope that is going too. New clubs can’t go into that bag. Three airline travel bags. One was plastic and wouldn’t accommodate my long driver. Two were cloth, one with a Las Vegas Desert Inn tournament logo. How old must that be! The other was just an ugly brown with a couple of holes in it. About the size of a golf ball or mouse. Then there was the “collection” (not the valuable kind) of clubs; an unhittable 3 iron, a couple woods (real wood), a couple other orphans that obviously got on my bad side at one time or another, and finally a bunch of putters, all with a story, none pleasant! And last but not least, head covers and other pro shop prizes that only lived in two places, the pro shop and my basement. Whew. Glad that is over. Now on to the magazine back issues. Have to confess, I have never made one. Guess I have never thought that good or bad luck pays much attention to the calendar. However, I do understand those whose year has been so wrought with misery and/or pain that the beginning of a new year offers hope and a fresh start. I have to wonder if the diet books and related programs and schemes enjoy a bonanza each January and do the tobacco folks experience the opposite? For a company like us, there is always the uncertainty as to what the year will bring and thus our inventory levels reflect our best estimates. However, though we sometimes miss the mark, typically our plan is to error on the side of over stocking. We work hard to avoid back orders and monitor our success or failure as a percentage of shipments made on time, which by the way generally is in the high 90’s percentile. So as we turn the page from 2010 to 2011, I wish you all the best in the New Year. If you make resolutions, I would like to know if it works to change behavior or achieve results. As for me, it’s not a resolution, but I am going to try and play a bit more golf. Happy New Year! Pick one from each category and find a peaceful spot to enjoy. Here is a recommendation that you must consider. If you are a coffee drinker or know someone who is or know someone who isn’t, this is a product you need to purchase either for yourself or as a gift. It’s a Keurig coffee maker! This coffee maker brews individual cups of coffee by simply inserting a K-Cup, which is an individual serving of coffee, tea, or hot chocolate, and pushing a button. Fifteen seconds later you are sipping a perfectly brewed cup. On the run in the morning and don’t want to fuss with making a pot, or perhaps at night you want regular and your spouse wants decaf, or if not a coffee drinker, how nice it is to offer a guest a good cup of coffee instead of the horrible instant ones or none at all. At our house it’s Caribou brand, regular or decaf. However, there are countless different varieties/brews from which to choose. The machines have been available at Costco for the past few months at $139 and a box of 80 K-cups costs $34, 43 cents a cup. Not cheap but the convenience, choices available, and the end of throwing out half full pots, all make it more than worth it.